Here You may find some our of beloved costumers reviews. We’re Always Trying to improve our services and so our customers feedback is like gold. Please feel free to feed us with your comments and throughs, your help will be very appreciate. We’re always looking to improve our services and so our costumers testimonials are very appreciate. thanks in advance for your help. Please upload a company logo or image to be featured with your feedback. mit Absenden des Formulars bestätige ich, die Datenschutzerklärung gelesen zu haben und stimme dieser zu. We have the team of neckAttack met in 2006 to our big summer festival in Leverkusen. Long queues in front of the masseurs and relaxed faces of the visitors spoke for themselves. Next time we will again use the services of neckattack to complete! With your new massage concept and the professional nature enthusiastic neckattack our guests in 2006. The likeable team, we can only recommend to all our customers. We particularly liked the uncomplicated and fresh type of therapists. The Australian Massage is ideal for any events. Love neckattack team, we would like to say a big praise! Under the “Keep Up” program some of their staff were with us today in the office and who massaged us. The young lady and the young man did an excellent job and leave us for a while the stress of everyday work forget! We will definitely recommend! Love neckattack team! our Berlin staff party in July 2009 to mark 40 years Vitanas you have significantly increased with the massages of the feel-good factor. I have received only positive feedback from our colleagues! 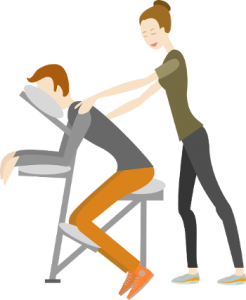 Make have a massage even several times. 🙂 Thank you very much, and that they have so spontaneously increases the service life of three to six hours! This is a selection of customers who have been commissioned by the mobile massage neckattack®.